I have used three different colours of alcohol inks on yupo paper for my background and added some gold splatters with Heidi Swapp color shine spray. 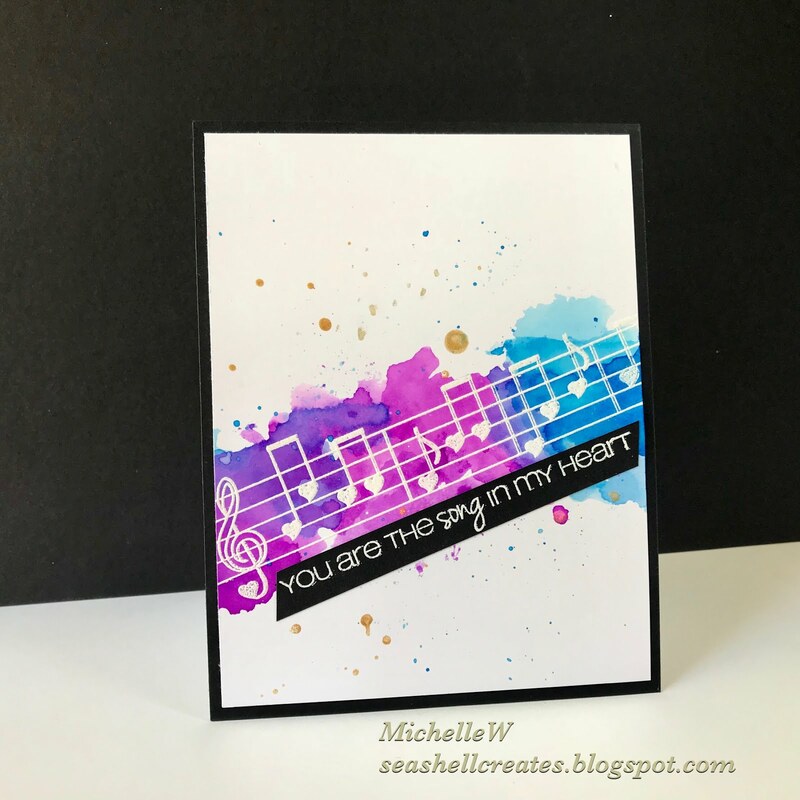 I stamped the music notes from CAS-ual Fridays Love Notes stamp set in CP Midnight ink. The sentiment is from the same set. I have that song in my head now! What's wrong with that, I'd like to know!! Hello, my card today is for the Heart challenge going on over at The Ton Challenge blog. 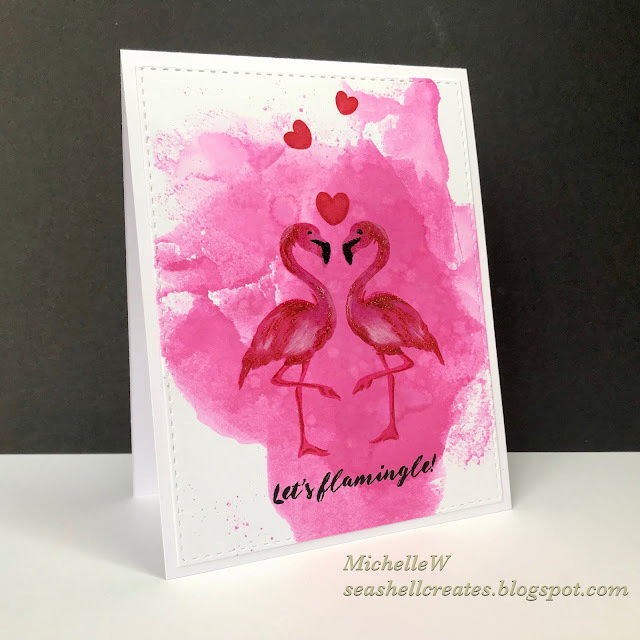 I smooshed CP Designs ink onto a piece of Bristol card stock with a piece of acetate and some water then I stamped the flamingo's from The Ton's "Darling Flamingos stamp set. This is a layering stamp set and it is quite easy to line up. The sentiment is from the same set. My hubby is getting an awful lot of love cards from me this month!! I added a little bit of white prisma pencil to the body of the flamingo just to lighten it up a bit. Hello, my card today is for the Papertrey Ink's Anniversary Challenge. I chose to use my all time favourite layering floral set "Rosie Posie" for this stripe challenge. My sentiment is from "Beautiful Brushstrokes". 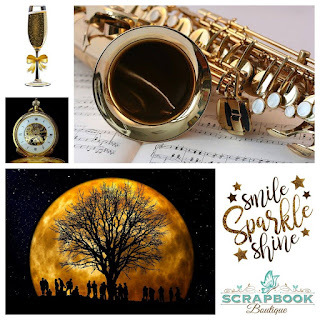 Thank to Kristie from Kreative Kristie for inspiring me to enter this challenge. Click here to see Kristies blog post. Thanks for looking, you can check the challenge out here! Hello, this is my second post in one day! I will get myself organised one day and post them all at once! 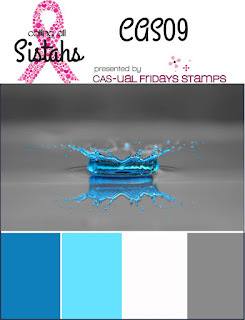 I am playing along with the CAS-ual Fridays Calling all Sistahs Encouragement Challenge and you can check it out here. I was inspired by the colours and I thought Catherine Pooler inks were perfect for this. 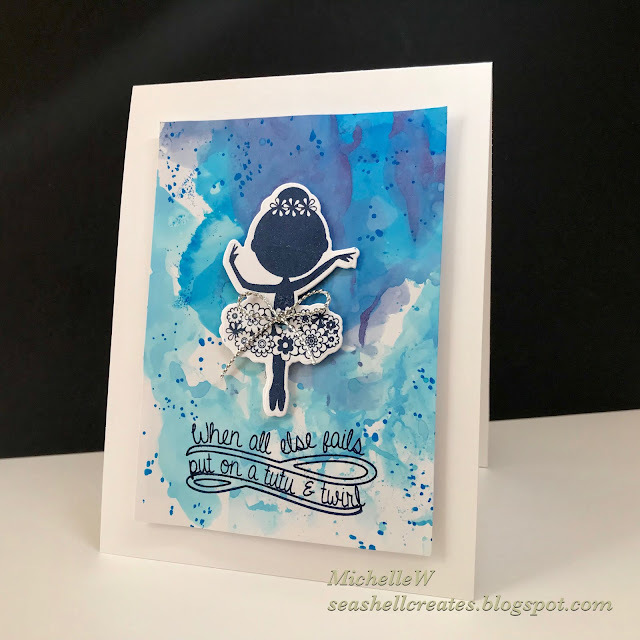 I used Juniper Mist, Something Borrowed and Fiesta Blue and did the ink smooshing technique again. The cute little ballerina and the sentiment is from the CAS-ual Fridays Tutu stamp set. 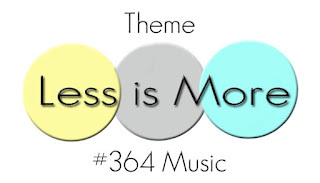 Hello, my card today is for the latest challenge over at Less is More where the cue card is Music. With Valentines day nearby I thought I would use the fun set from Casual Fridays called Love Notes. It is perfect for this challenge! I white heat embossed the music notes and smooshed CP Designs ink in Flirty Fuchsia and Something Borrowed over the top. 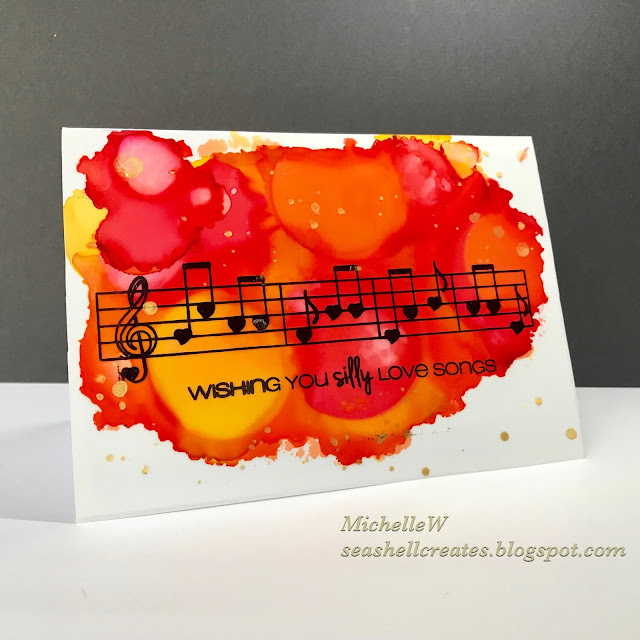 I white heat embossed the sentiment from the same set onto a strip of black card stock and added some splatters of the Something Borrowed and Heidi Swapp Gold color shine. Thanks for looking, you can check out the challenge here!